Ladies and Gentlemen, it is finally time for the British aircraft carriers line to fully be released but that’s not all! We are getting the April fool event with Space battles (and the torpedo beat mode! Seriously that mode is just so fun.) and the 5th season of Clan battles! Attention! From April 1 until April 8, you’ll have the opportunity to retrain your Commanders and reset their skills, as well as demount upgrades, for free. Also, With the release of Update 0.8.2, the option in the Inventory section to exchange researchable aircraft carriers for XP and credits, or Premium aircraft carriers for doubloons, will cease to be available. The update size is 1.6 GB. The servers will be unavailable as usual during the installation of the update. On the European server, it will be down on Monday 01 April from 07:00 CET (UTC+1) until 10:00 CET (UTC+1). On the North American server, it will be down on Monday 01 April from 03:00 AM PT until 06:00 AM PT. On the South-East Asian server, it will be down on 01/04/2019 from 05:00 (UTC+8) until 08:00 (UTC+8). 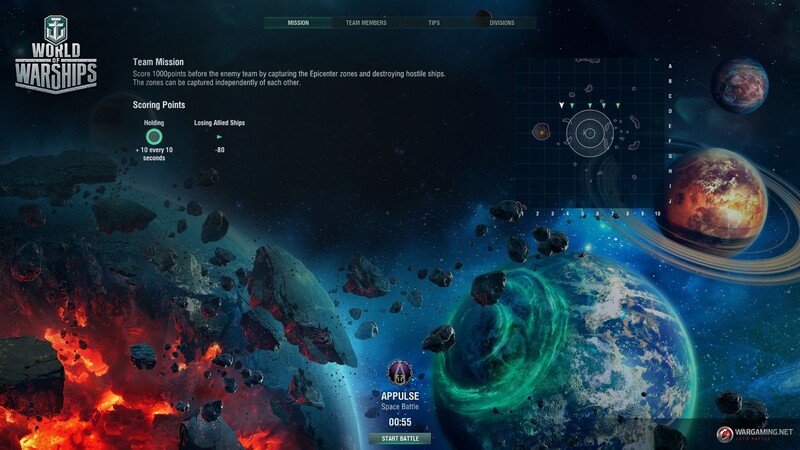 Battles will be held on 4 maps purposed for space engagements. Players can participate in Space Battles behind the helms of 12 special spaceships. 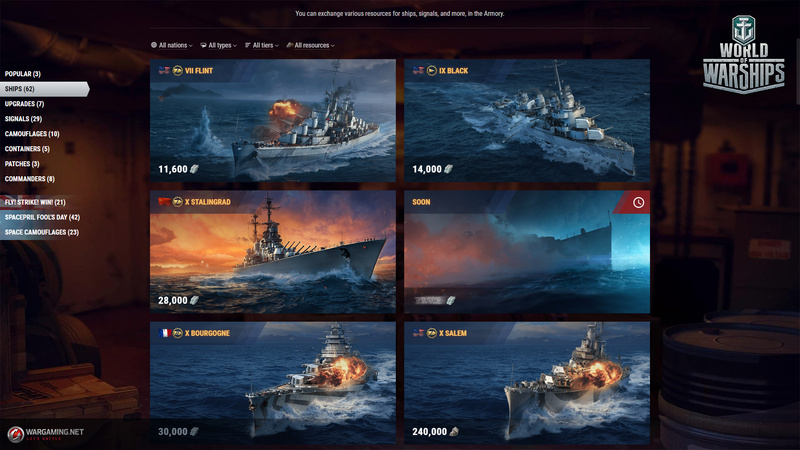 11x permanent space camouflage patterns for Tier X ships: 9 of which will already be familiar to you from last year’s event, plus 2 new ones for X Hindenburg and X Shimakaze. Bionic permanent space camouflage patterns for researchable U.S. and French Tier VI–X cruisers, obtainable for doubloons. Camouflage patterns for Tier VI–IX ships can also be earned as rewards for completing Directives. Unusual achievements, bestowed for the demonstration of a variety of combat skills in the new battle modes. With Update 0.8.2, the final part of the “Fly! Strike! Win!” event begins. Its rules are similar to those of the previous parts, except for the difference that this time there is only one Stage consisting of four Directives, each comprising 10 missions. The event’s Directives will be unlocked on a weekly basis, and must be completed in a sequential order. 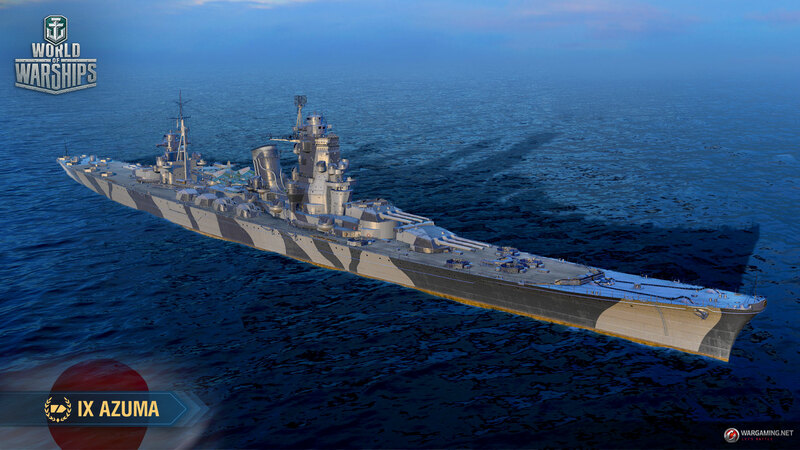 Various in-game items, permanent space camouflage patterns for researchable U.S. and French Tier VI–IX heavy cruisers, and Naval Aviation containers are the rewards for completing its missions and Directives. Premium aircraft carriers will also be available in the premium shop soon. Further details will be announced on our portal. A chance to get one of the following Premium aircraft carriers: VIII Graf Zeppelin, VIII Enterprise, VIII Saipan, and VIII Kaga. Each comes with a Port slot and Commander with 10 skill points. 2x special signal flags of the same type (Dragon, Wyvern, Red Dragon, Ouroboros, Hydra, Basilisk, Scylla, or Leviathan). 3x Sci-Fi Space expendable camouflage patterns. 20× special signal flags of the same type (Dragon, Wyvern, Red Dragon, Ouroboros, Hydra, Basilisk, Scylla, Leviathan). 20× Sci-Fi Space expendable camouflage patterns. If you already have the aircraft carrier you find in the container in your Port, you’ll receive the full cost of the ship in doubloons as compensation. After the release of Update 0.8.2, all Crowns received in 0.8.1 will be converted into Florins at the exchange rate of 1:8. Florins can be exchanged for credits, signal flags, Warships Premium Account, and Union Jack expendable camouflages in the temporary category of the “Fly! Strike! Win!” event. Please note that British aircraft carriers will no longer be available in this category. If you regularly log in to the game during the period from April 12 through April 26, you can claim the following rewards in the Daily Shipments section: credits, Sci-Fi Space camouflage, Warships Premium Account, doubloons, and Naval Aviation containers. You can get a total of 10 rewards, while the shipments are available for 14 days. Thus, you can skip 4 days out of two weeks and still claim all of the available rewards! Early access to the carriers is finally coming to an end, and British aircraft carriers are taking their official place in the Tech Tree. Those ships already familiar to players from the previous update will be supplemented with researchable Tier X aircraft carrier X Audacious. She can boast of her aircraft’s combat efficiency being the most impressive in the game. Her attack aircraft and bombers carry a large number of rockets and bombs, and the converging torpedo cone of her torpedo bombers enable them to accurately attack the enemy’s bow or stern when fully aimed, in addition to their broadsides. More details about X Audacious and other British aircraft carriers are available in a dedicated article. The main interface mode displays flight number indicators, current maximum number of aircraft in a squadron, and their status. A filled green indicator denotes a fully equipped flight. This mode allows players to quickly and easily assess whether a complete squadron can be launched, how many flights it includes, and how many attacks can be carried out. The alternative mode shows the current and maximum number of aircraft of each type, as well as the time left until a new aircraft appears on deck. This mode enables the assessment of the total number of aircraft of various types, without dividing them into squadrons and flights. The Alt key is used for displaying the alternative interface mode by default. The displayed aircraft HP indicators are now divided by flights. This enables players to better assess the number of attacks a particular squadron might be capable of carrying out. That was my little complain about the 0.8.2. When used on aircraft, the Radio Location Commander skill made it easy to find and follow destroyers, thereby depriving them of their main advantage—concealment. In order to reduce the excessive influence of aircraft carriers on the detectability of destroyers, the effects of the Radio Location skill will no longer affect squadrons. With the changes in detectability range by air that were introduced in Update 0.8.0.3, the spotting destroyers has become even harder not only for ships, but for aircraft as well. If you have an aircraft carrier-specialized Commander who has mastered the Radio Location skill, it will be reset with the Update’s release and the Commander will receive 4 skill points. This will enable you to reallocate these points. Any attempt to direct a squadron through the common AA defense ranges of several ships is a sure way to lose aircraft in vain. To solve this problem, we’ve implemented a method of non-linear addition of the continuous damage caused by AA guns. In Update 0.8.2, damage dealt to a squadron in the AA defense range of a single ship remains unchanged. In cases when the number of ships sharing a field of AA fire increases, the continuous damage caused to the squadron will be lower than the total sum, but still much higher than the damage from any one of them. This new feature makes it possible to attack a group of several ships, without devaluing the benefits of ships cooperating in defense against air strikes. A bug has been fixed which affected the detectability range of ships by air in the Local Weather. 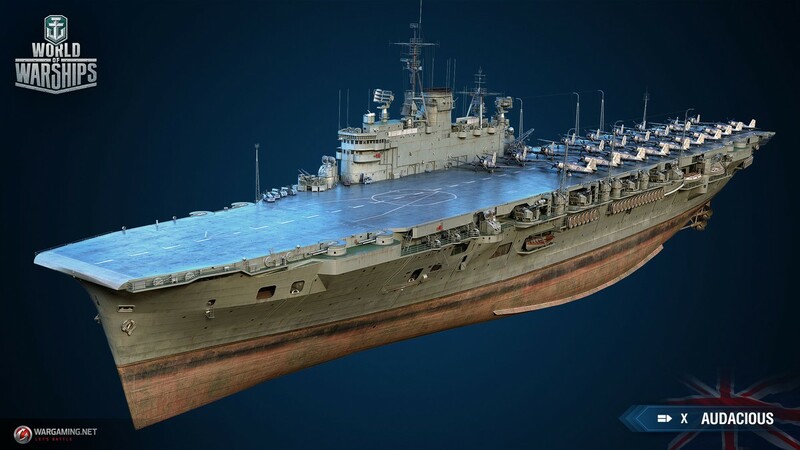 This bug decreased the “Detectability Range by Air” parameter by 90% with AA defenses disabled, which made the detection of such ships almost impossible. Now, the Local Weather will not affect detectability range by air. 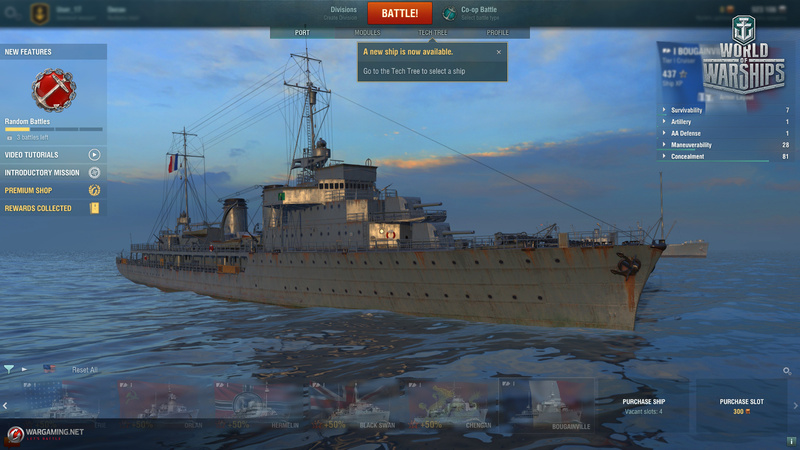 Our work on the Port interface continues, and in Update 0.8.2. we’ve reworked the banners on the left-hand side. They are now more compact and unified. 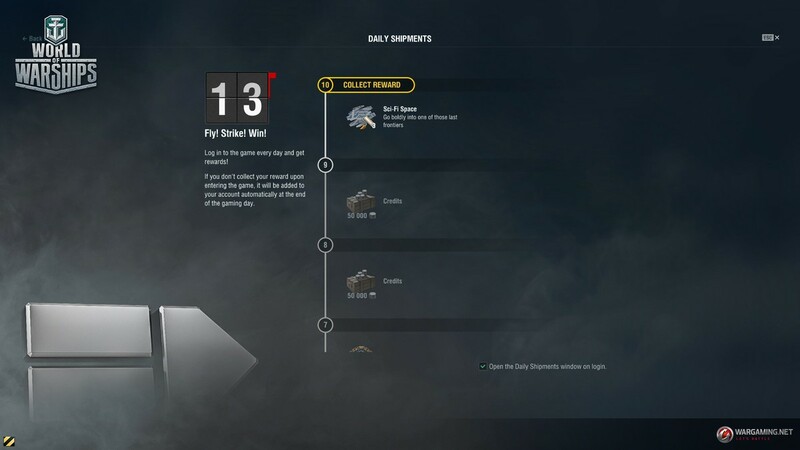 A Service Record banner displaying your progress and the soonest-arriving new game features has been added. After playing your first 35 battles on the account, this banner will be minimized. If your progress is blocked for unsporting conduct, the banner will display the relevant message in regard to this. To free up some space for information relevant to players, we’ve also updated the panel in the upper-left part of the Port. The server name and number of players have been moved to the main menu, which is opened with the ESC key. These have been replaced with the Port selection button and insignia transfered from the Service Record section of the profile. Some of the menu items displayed upon clicking the nickname have been removed as they were duplicated in other parts of the interface. Now only the “Purchase Premium”, “Invite a Friend”, “Inventory”, and “News” items remain. Changed the display of progress for unlocking new in-game features and rewards. You can select an in-game feature and check out its detailed description and associated video. The progress bar demonstrates the available rewards for various in-game achievements, as well as the player’s progress on the journey to acquiring them. Tips display the number of battles to be played to open a particular reward. All of the interface changes mentioned above improve the visual perception of the Port, making it easier for players to navigate the various in-game features available to them. 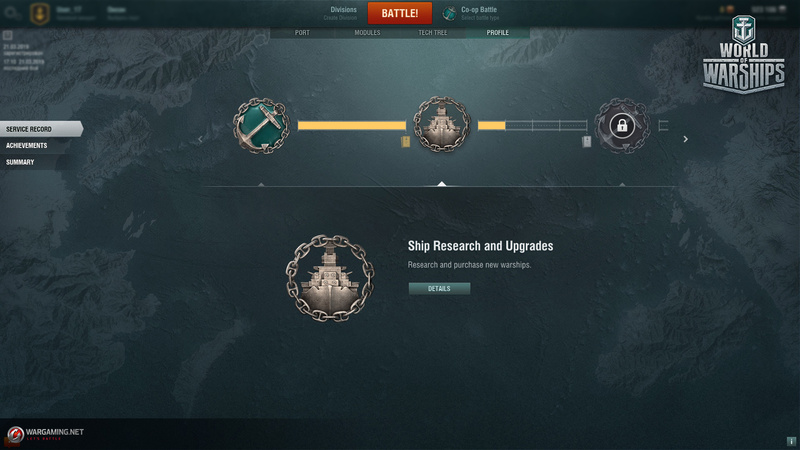 Prior to Update 0.8.2, access to in-game features and rewards was determined by Service Record level, which in turn depended on the number of battles played. With the release of 0.8.2, the Service Record level gets removed, and the number of battles played will be counted directly to determine which in-game features are available to a particular player. At the same time, the number of battles required to gain access to each of the various in-game features remains the same. If any of them have already been unlocked, you won’t have to do so again. 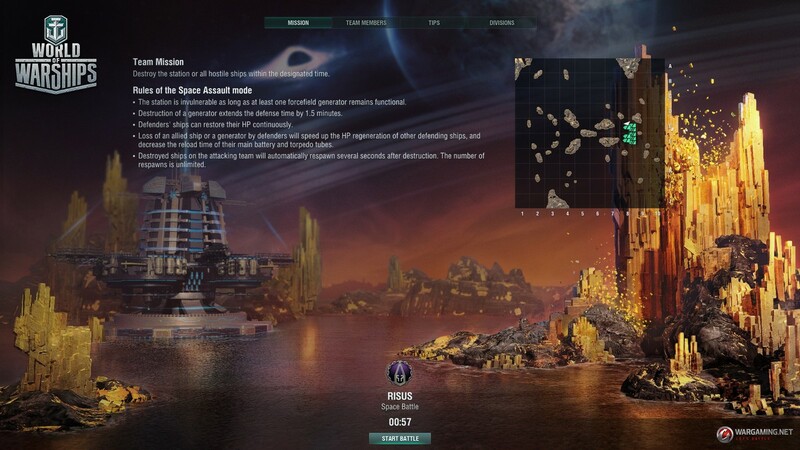 A chain of tips leading players to research and obtain a Tier II ship has been added for the convenience of new players. 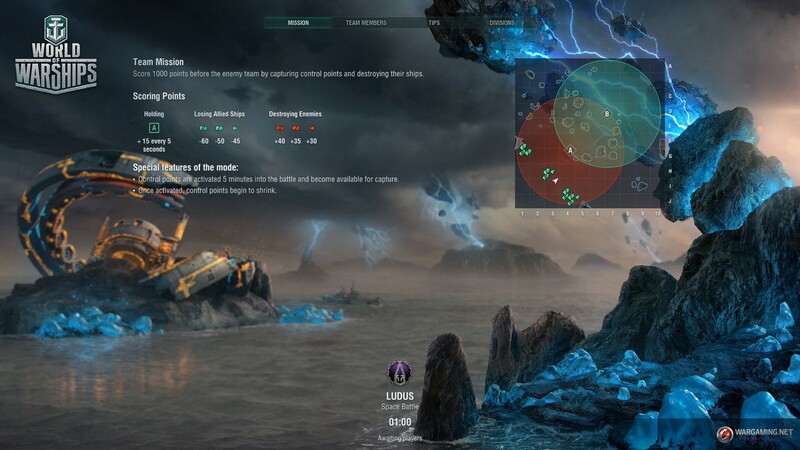 These tips appear after you have played one battle, and on condition that you have enough experience and credits to research and obtain a ship. 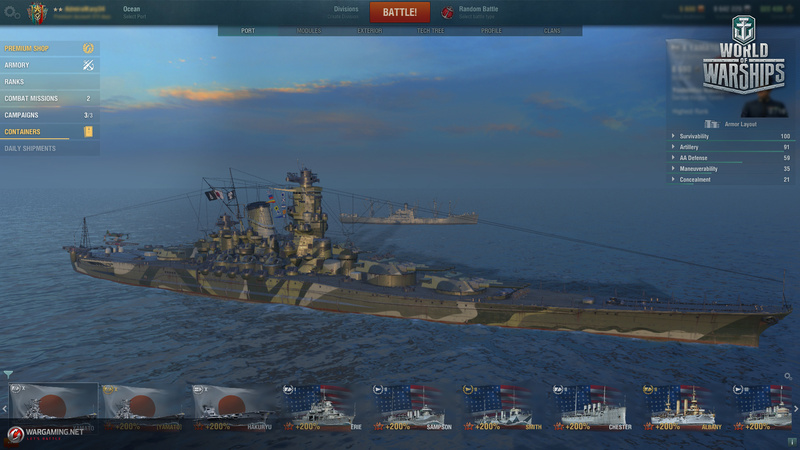 Upon the purchase of a Tier II ship or above, the tips disappear. A tip can be closed during the game session, and will reopen when visiting the Port again (including when entering from battle) or when restarting the game. 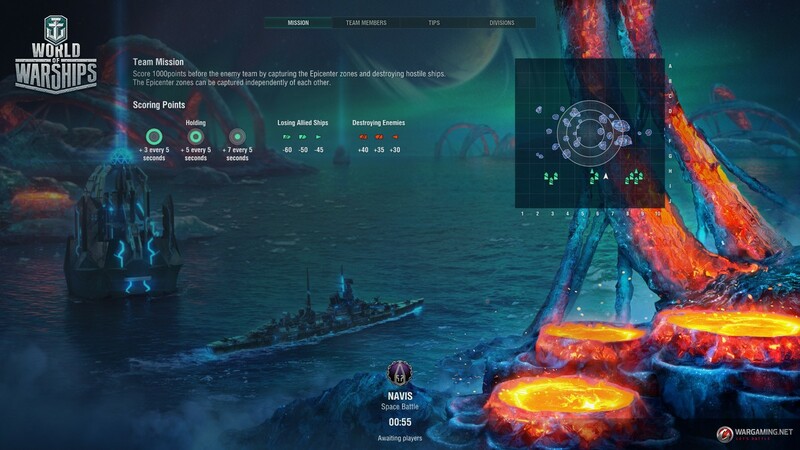 The tips are not shown if a player already has a Tier II ship or above in their Port. Take part in Season 5 of Clan Battles! Gaming sessions are available on Wednesday, Thursday, Saturday, and Sunday. Please note that on the release days of any updates, no Clan Battles will be held. 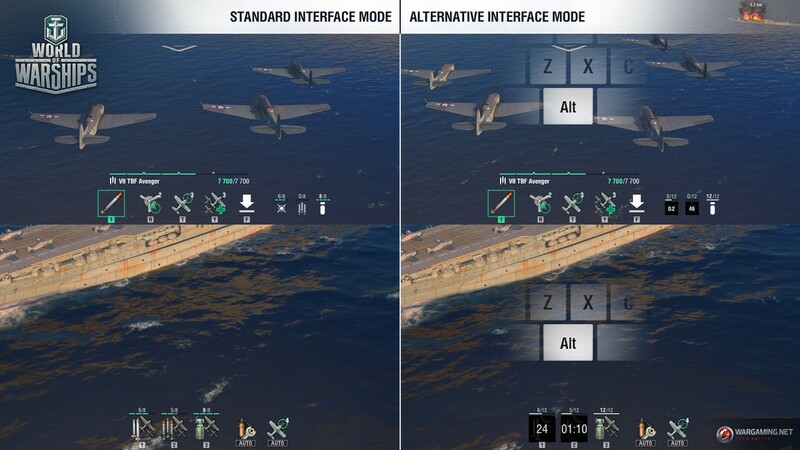 Players will use Tier X ships. Teams of 7 ships, with a maximum of one battleship and no aircraft carriers allowed. There are 5 Leagues in the Rating system: Squall League, Gale League, Storm League, Typhoon League, and Hurricane League. The Ratings of all Clans will be reset to standard values, but for the first battle played in each League (except for the Squall League) during the “North” Season, Clans will get 50 bonus points (up to a maximum of 200 points). The main changes in the new Season focus on improvements of the matchmaking and map selection algorithm, as well as the introduction of the cross-server matchmaker. The total number of rewards that players can earn remains almost the same, and the amount of Steel hasn’t changed—you’ll still have a chance to earn up to 11,000 of this valuable resource! More details about Season 5 of Clan Battles are available in a dedicated article. Due to significantly extended stock and increased functionality, the Arsenal is getting a new name—Armory. The updated section will be stocked with 50 bundles containing Premium ships that can be obtained in exchange for doubloons. Some of these ships have been removed from the Tech Tree in order to put greater focus on researchable ships. In future, we are planning to increase the number of Premium ships available for doubloons in the Armory to provide you with a wider range of choice. All ships presented in this section come with a Port slot (included in the indicated price), and a Commander with 3 skill points. We’ve equipped the Armory with filters for type, nation, tier, and required resources to simplify searching for the desired ships. Starting from 0.8.2, new permanent camouflages that can be obtained for Copper or Molybdenum will be regularly added to the Armory. The resources required to obtain these will alternate with every update. 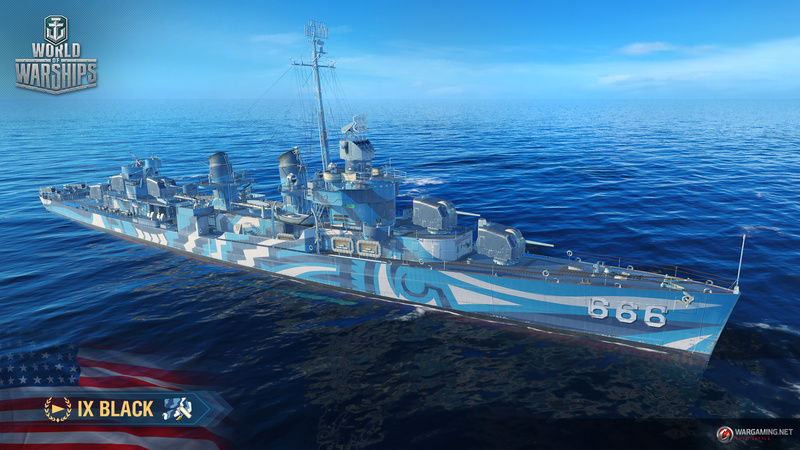 In Update 0.8.2, destroyer IX Black will receive her new Marlin camouflage. To make gameplay more convenient, the cruising speed of aircraft for all Tier IV aircraft carriers has been increased by 10%. The number of bombers in a flight has been increased from 1 to 2. Aircraft restoration time has been reduced from 142 to 96 seconds. The size of the crosshair ellipse at the moment of attack has been increased by 22%. The size of the crosshair ellipse at the moment of attack has been increased by 30%. Damage has been reduced from 5,930 to 5,200. The chance of causing flooding has been reduced from 51% to 45%. Your bombers can now carry out only 2 attacks instead of 4, but to balance this, each approach to your target will be more effective, and squadrons will spend a shorter amount of time under AA fire. The crosshair size has been increased in order to take into account the addition of a second aircraft to the flight, and an increase in the number of bombs dropped. The torpedoes of researchable torpedo bombers have been replaced, as they previously demonstrated much better performance in comparison with other same-type ships. Besides that factor, this change compensates for the increased bomber damage. 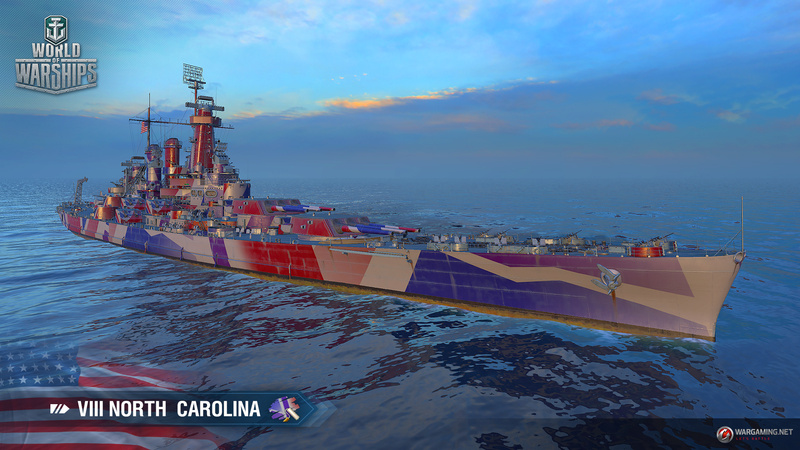 Added the new Stream Dream camouflage, which can be received during official World of Warships streams. Added a commemorative flag for aircraft carrier VIII Saipan, and the CV Armada flag that comes with purchasing a bundle containing all Premium aircraft carriers. Added a patch granted for visiting official meetings of players held by the World of Warships team. Added a patch for participants of the King of the Sea tournament, which will be granted for special achievements. Japanese cruiser IX Azuma has been added to the Tech Tree, and is now available for 1,000,000 Free XP. Azuma carries 310 mm caliber guns, and stands out due to her weighty salvoes, enjoyable ballistics, and powerful Japanese HE shells. Everything aforementioned is supplemented with an impressive pool of hit points for a cruiser, as well as an additional charge and short reload time for the Repair Party consumable. Also, a severe lack of armor for that kind of ship so unless you really want her hard or that you don’t know on what you should use your free XP, I would say that Azuma isn’t the best tier IX premium in the house. We fixed an interface issue connected with processing a large number of elements. This was the root cause of single instances of extensive hanging, as well as a series of FPS drops. We fixed the icon update logic for instances of fire and flooding, as well as for damaged module icons. In some cases, the update logic of these had a significant negative impact on performance. We also had to disable texture loading, the so-called texture streaming, in battle. This was due to its connection to identified streaming issues that were causing a sharp decline in performance. This change will have no effect on client stability. Streaming will certainly be brought back in the nearest updates so that we can continue to improve the quality of content. All of the feedback we received from players has been carefully processed. For example, we checked the players’ theory of FPS drops being connected to the visual effects of AA defenses. Our investigations found the root cause to be different to what players suspected. The AA defense effects don’t have any considerable negative impact on performance, and the underlying reason for the problems experienced has been described above. We would like to thank you all for your many summaries and bug reports, which helped us a great deal in identifying and solving these various issues. Minor improvements to the geometry and textures of the following ships: IV Hermes, VIII Kagero, VIII Lightning, V Oktyabrskaya Revolutsiya, X Bourgogne, and VII Minsk. Adjusted the aircraft position on the decks of the following aircraft carriers: VIII Indomitable, VIII Graf Zeppelin, and VIII Enterprise. Added cities on the islands of the Ring and Shards maps. Removed researchable modules from Tier I ships. Bonuses provided by them are included in the ships’ parameters. 600 XP will be added to the relevant ships for each researched module, and 6,000 credits will be added for each purchased module. Increased the chance that a random researchable ship of the same tier and type can appear opposite a player’s ship in Co-op Battles in place of a similar ship. Fixed an issue when the game client froze at the authorization stage if the Internet connection was lost in the process of logging in. Fixed a bug with displaying the cost of consumable auto-resupply. Added an alternative permanent camouflage color scheme for cruiser VI Leander. Fixed a bug when the icon didn’t change after selecting another battle type in the Summary section of the profile. Fixed a bug causing fighters to disappear if the flight they followed delivered an attack. Fixed an issue with the incorrect display of the deepwater torpedo icon in the interface in battle. Fixed an issue with the incorrect description of the Defensive Fire consumable: removed irrelevant information about the reduction of bombers’ and torpedo bombers’ accuracy of attack. Fixed an issue with the incorrect names of aircraft on aircraft carriers VIII Enterprise and VIII Shokaku. The section with damage caused by aircraft on the battle results screen is now displayed only for aircraft carriers. Fixed an issue when 113 mm caliber guns weren’t taken into account in the long action range of aircraft carrier VIII Indomitable’s AA defenses. Now squadrons correctly spot all enemy structures in the Killer Whale operation. Output of the voice chat sound is directed to the device by default. Fixed a bug when application of the last charge of the Fighter consumable didn’t work. Fixed a bug causing falling bombs to miss the crosshair when dropped during turns made by flights. Fixed a bug when the rudder position change wasn’t updated on the rudder indicator while the automatic collision avoidance system was operating. Fixed an issue with the incorrect description of destroyer X Daring in the Tech Tree: indicated the correct caliber of her main battery guns (113 mm). Fixed a bug when the aircraft Boost could work longer in cases where the W/S keys were pressed frequently. Now, all achievements are displayed in full screen when all of them are received. Fixed an issue with the incorrect display of aircraft crosshairs in situations where skills and upgrades influence an aircraft’s speed. The New icon is no longer displayed if the player doesn’t have access to the features within. Fixed a bug causing fire and smoke effects on ships to disappear.